“Do I smell rot?” Jan asked as she swirled her Long Dog 2007 Otto Pinot Noir. We were wine touring in Prince Edward County with cousins from France. They’re not French; they are part of a colony of Brits who have retired in the pastoral countryside of the Midi Pyrenees area of Languedoc but they love wine touring. We had a lovely wine tasting at Huff Estates , where nothing disappoints. I left with a bottle of Vidalescco and she with a First Frost. Then on we went to Karlo Estates where the vineyard manager showed us grapes just out of the de-stemmer and we’d gone on to a full tasting there as well after thoroughly exploring their lovely old barn. They walked away with the Merlot and I bought the white (heaven in a glass) port.We’d had lunch at the Barley Room at the Waring House where the men enjoyed the Barley Days Loyalist Lager. I’d saved Long Dog Winery for last as their Pinot Noir vines are the oldest in the County and they have a selection of beautiful and surprisingly affordable Pinot. The word “Rot” hung in the air. Apparently with the Brits this is a good thing, It means full-bodied and gutsy which was about right. Amazingly Lahti decided not to throw us out but instead took us for a tour. First stop was what he jokingly calls the “swinery” a repurposed pig barn where the grapes are brought in for a cold soak for a week. We tasted the grapes that had just been harvested that day. that were bathing in their own free run juice. Then into the fermentation shed where he opened the lid on a tank of Pinot Noir grapes that had finished their cold soak week and were just starting fermentation. We did. Decidedly cherries and chocolate! 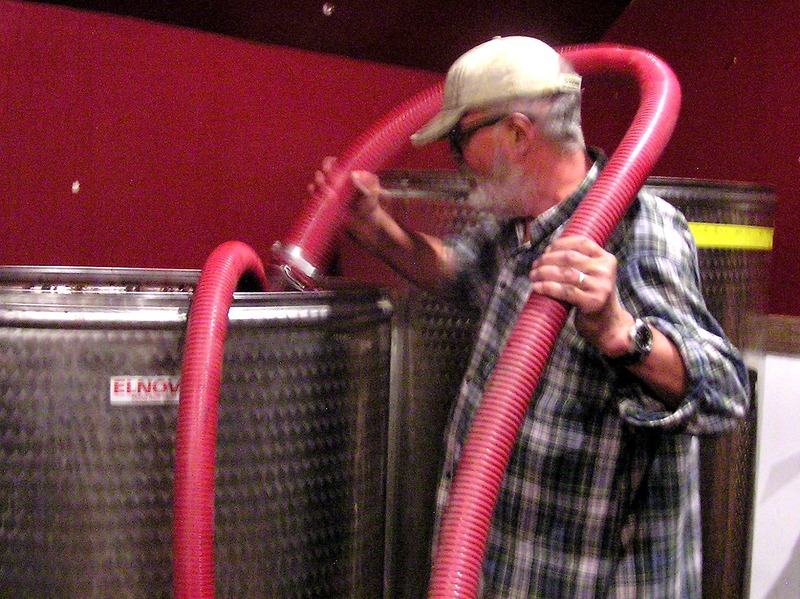 He then opened a second standing tank that was a few days further along in the fermentation process, wrapped himself in the long red hoses of a pump, and aerated the grapes bringing those from the bottom up to the top to make a more uniform blend. The air was filled with the rich yeasty smell of fermenting grapes. My guests who have wine toured on four continents had never experienced being this close to the fermentation process. It made their day. Mine too. I went home happy with a bottle of my favourite “rotting” Otto 2007 Pinot Noir and Cousin Jan bought a bottle of ” stonking” 2009 Top Dog Pinot Noir to take back to France. I like the idea of County Pinot Noir going back to France.